The author won the Edgar Award for best crime novel four years before the Belting Inheritance was published in 1965. An orphan is brought to stay at Belting at twelve. There is the formidable Lady Wainwright, and her two adult sons, Stephen and Miles along with Stephen’s wife, Clarissa. Lady Wainwright is haunted by the wartime deaths of her two older (and favorite) sons, Hugh and David. Flash forward six years to the orphan returning home from school before his scholarship in the fall. There is a man claiming to be David returned from a Russian gulag. As Lady Wainwright is contemplates changing her will, both Miles and Stephen try to prove the interloper a fraud to preserve their inheritance. I enjoyed the many twists and turns of the plot in this slow moving tale. However, there is absolutely no way to guess the denouement because crucial information is kept from the reader until the slam bang ending. 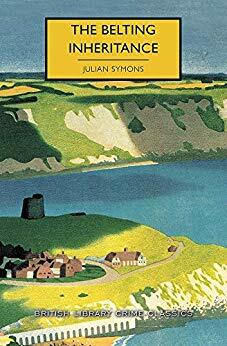 While not for armchair detectives, the Belting Inheritance is a good post-Golden age British mystery. 3 stars. Thanks to Poisoned Pen Press for an advance copy in exchange for an honest review.